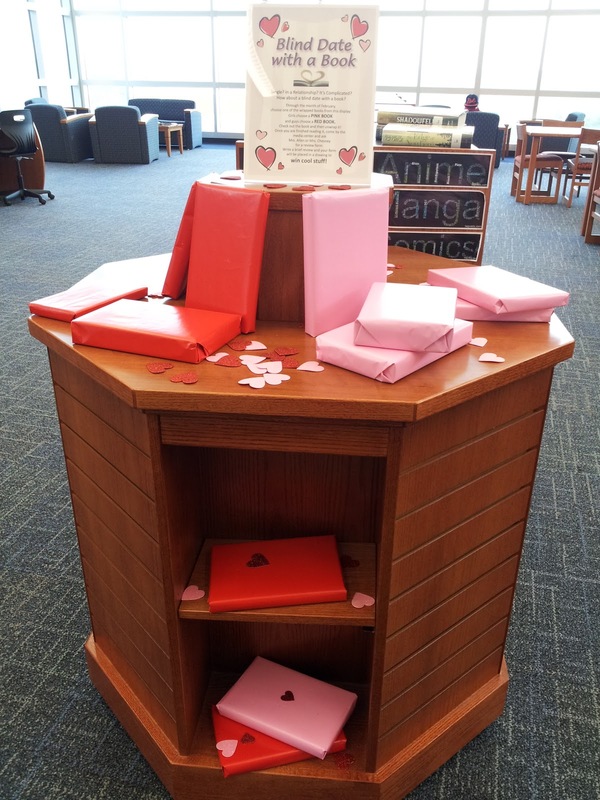 For students who might not have a book boyfriend or book babe in his/her life, there's always the chance of meeting a potential book crush on a book blind date. My fabbo new intern, Janet Allen, approached me with this idea, and I said, "Start your matchmaking!" 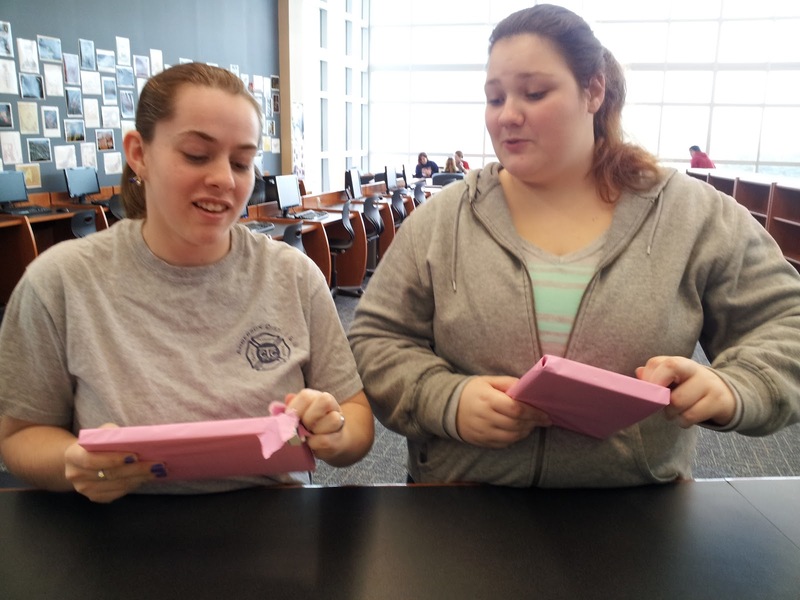 The idea is to pull books, wrap them up, and then give students the opportunity to choose a book to take on a date (y'know, check-out) and see if they're compatible. Who knows, he/she might even fall in love with the book! We ask they at least give the book a few chapters before kicking it to the curb, and who knows - it might be love and the student will want to go out with other books by that author or in that genre. The idea is to step outside your book dating comfort zone and try something new! Every student who goes on a book blind date can report back with a brief review letting us know if he/she'd give it a rose or send it packing home. Regardless of the outcome, there's the consolation prize of some candy for taking a chance on book love. We wrapped books that girls might like in pink, and books for guys in red to help guide their choices. Like people, books come in all sizes - some went for skinny, some chunky, some short and some tall. We did discover that it might be best to choose books that are high interest and entertaining but maaaaaybe haven't been on a date in awhile. Some of our kids who are BIG readers opened 2-3 books before they found one they hadn't read. I teased a couple of the girls that that's what they get for being such book sluts! 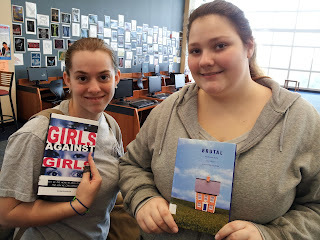 We decided that would be an awesome name for a girls' book club at school...except our administration probably wouldn't find it as amusing as we do. ;-) Also, don't forget to throw some cool nonfiction books in there - nonfiction books need love too!! but she's willing to give Brutal and it's take on bullying a chance. Love your interns spin on this!! This is wonderful. I used the example from Rachel (http://mpl-yaz.blogspot.com/2013/01/blind-date-with-book.html) and her dating profiles, but now I'm thinking of refilling the display with just wrapped books, no profiles. My display was completely empty the first day I had it up so I need more books!